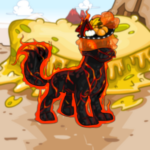 It had come to the attention of mostly everyone in Neopia that for some reason, many Neopets and even a few Petpets ate Petpets. Cannibals! So invitations were sent out. They went to Grarrls, Skeiths, Jetsams, and even a few Lupes. They also went out to the most famous of Petpet eaters, Florg, the Turmaculus, and Balthazar. You could just tell right away there would be chaos. The day finally arrived. All of those invited had RSVPed, and the Gelert waiters and waitresses were waiting for them to come. In the dining area, Petpets were caged up and set on tables. Many varieties set up as to please the guests. The first to arrive was Florg. He had a look in his eyes that made you shiver. Everyone stepped back and he walked over to a table. The mutant Chia sat down. Next came the enormous Turmaculus. There had been much debate as how to get him here, but they had managed by calling on faerie abilities. A few pets were carrying him, using super strength and flight. They laid him down at the closest table, happy to be relieved of the weight. It was the same table Florg was sitting at. The Skeiths arrived next, spreading out over the room and sitting at random tables. They all looked happy to be there, and had brought forks, spoons, and napkins along. Then the Jetsams arrived. A bubble enclosed around most of them, giving them water. They also spread out. The Lupes appeared almost immediately after. There was only a few of them, though, looking quite sad. The Gelerts handed them a few Lupe treats and then they were happy. Quickly after, the Grarrls arrived. They were enormous! Even the babies were, ranging from the size of a JubJub to about the size of a full-grown Skeith. Among them was Sir Alright, the enormous mutant Grarrl known to eat anything in sight, no matter the cost. Rumor had it that he even ate fellow pets! All the Gelerts stood aside and let them through, clearly scared, the Grarrls’ growl-talk echoing through the enormous hall. Finally the infamous Balthazar walked through the doorway. All the faerie Gelerts quickly stepped back, not wanting to quarrel with the famed faerie-catcher. He sat next to Turmy and Florg. He grunted a hello. Turmy yawned, and Florg banged the table. “Florg hungry!” he bellowed. The Gelerts quickly rushed to the tables to take the guests' orders. The Gelerts didn’t even want to be there; they had been forced to. No one knew how, but no one dared ask. Florg ordered a purple kadoatie, Turmy asked for the special, and Balthazar said both hungrily and simply, “Babaa ‘n doglefox.” The Gelerts hurried off. Over at Sir Alight’s table, everyone but Turmy, Balthazar, and Florg was gathered around as they watched what he had ordered. A spyder, two kadoaties, four slorgs and three haseepuss resided on his plate. Everyone gasped as in one fluid motion he gulped down the Petpets he had ordered. Their screams echoed through the hall. He raised his hand to call a waiter for seconds, and everyone disbanded to eat their own meals. Everyone was making small talk. In between petpets, the pets discussed their lives, hunting habits, and what their favorite foods, toppings, and spices were. Soon it was silent as the host of the event stepped forwards on a large stage in the front of the room. There stood a faerie Lupe, who was smiling a kind smile. “I ask everyone to enjoy their time here!” he called out, and then gestured to a small band that started playing upbeat jazz music. Everyone, even some of the Petpets, were swaying to the catchy tune. Florg’s tongue shot out, snatching a crying hasee off his plate, when Balthazar made the comment that cued the disaster. “Turmy, pal, ain’t you a Petpet yerself?” The giant green-and-purple creature peered up from his plate, which was currently clean. The Lupe grew, and grew, and grew, until he was twice the size of the Grarrls attending. He leaned back, then leapt forwards, mouth agape. Soon Florg was on the receiving end, sitting on his gigantic mouth surrounded by teeth the Chia’s size. The Lupe swallowed, a sly grin creeping onto his face. But the next player was ready. Sir Alight grinned, and looked up at the Lupe who was not quite double his size. He took out the item he had spent his entire life saving for. And this was the right moment to use it. “SUPERSIZE GARGANTUPLEX!” There was a bright light as the Grarrl grew larger, and larger, and larger, until he was 40 times his original size. The hall wasn’t that big, though. He crashed through the ceiling, debris raining down on all of the pets and Petpets residing in it. His paw swooped down, grabbing all of the Petpets in the hall into his fist, and poured them into his mouth. Sir Alight then bent down and grabbed Balthazar, who was struggling in his grasp. His mouth opened barely, but it was wide enough to fit the over-size Lupe in. His mouth closed, gargantuan teeth blocking any escape. He gulped, swallowing both Balthazar and the Petpets. She held her hands up, freezing Sir Alight in place. “I cast a spell upon thee here, may the ghost of Petpets come near. Give them a dose of what they did, for this spell cannot be rid!” Darkness covered the room, encasing all but the Gelerts, who had magically disappeared. It then dispersed, revealing all of the guests to have turned into Petpets. They all screamed in terror. But Sir Alight screamed the loudest of all. For he was now a mutant Chia. Florg. Fyora hung her head. “Alas, I could not counteract the supersize, so I turned him into the most hated Neopet to exist in all worlds, the only pet close in size.” Sir Alight’s gaze turned to her. They were nearly the same height, although Florg was about four inches taller. He spotted a bottle on the floor and picked it up, opening it and turning it towards the Faerie Queen so she may be sucked in. But in less than a second, Fyora cast a spell to teleport away. And that is what happened the day Neopets went down. Scoring Big in The Haunted Shootery! The sides of the wagon open up and guess what, you're at a shooting gallery! How wonderful.